Faced with the fact that VW is struggling to to keep customers, the brand has launched a new website with the hope that it will better engage potential car-buyers and boost sales. The new format takes cues from "online dating" sites and is more "tablet friendly." "Our goal was to put the consumer's needs first. We did that by keeping things radically simple, reducing clicks, and focusing on getting people to real cars quickly—not vehicle configurations that are hard to find in real life." 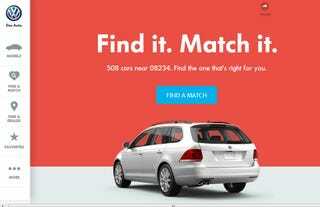 Inventory-led shopping experience: Customers can specify desired features and find cars near them that match their needs from the VW.com inventory of more than 80,000 vehicle profiles. Non-linear shopping flow: Customers can find cars through a variety of search capabilities, from style and color ("red convertible") to specific features ("premium sound"), and each car has its own profile page−not dissimilar from popular dating site profile pages as well. Contextual information and tools: Tools such as the Payment Estimator are built into the shopping experience so users don't need to leave the profile page to get to them. Full model line information: Each model page has all available trims linkable to current inventory. Feature-focused inventory pages: Certain high-profile features such as Fender® Premium Audio System have their own pages, which also display inventory. Real-time feed with Volkswagen news: All VW social content is aggregated into a single interface, so users can keep their finger on the brand's pulse. Content can be sorted by model. Jetta- Sub par refreshed compact seeks partner with low expectations and no previous VW relationships. I navigated the site and did find the new design to "flow" much nicer than the old one. I have not tried it on a tablet, because I don't own a tablet. I really liked the integrated "payment estimator" and the 360 views. Vehicle colors are more true to real world than before. There are a few things that need work. If you try to find a match for "used cars" the the site searches forever and nothing happens. I really don't like the fact that there is no "configure" or "build" button. Overall, it seems like a well executed upgrade that should appeal to younger buyers. So head on over to the new VW.com and post your critiques in the comments below. Oh, and just for fun maybe write up a "dating profile" for your favorite VW. Find the Volkswagen that&apos;s right for you. Check out videos, galleries, features and more.